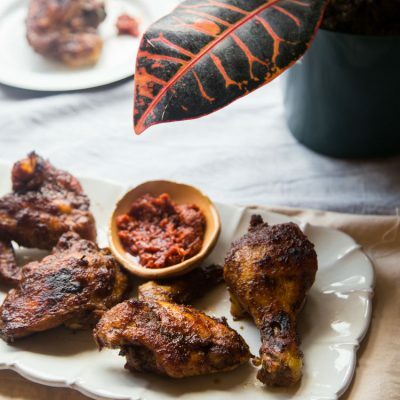 Ayam Panggang Bumbu Kecap (Indonesian Kecap Manis Broiled Chicken) – Pieces of chicken are pressure cooked with aromatic spices, herbs, and kecap manis and finished up cooking in the oven by broiling. 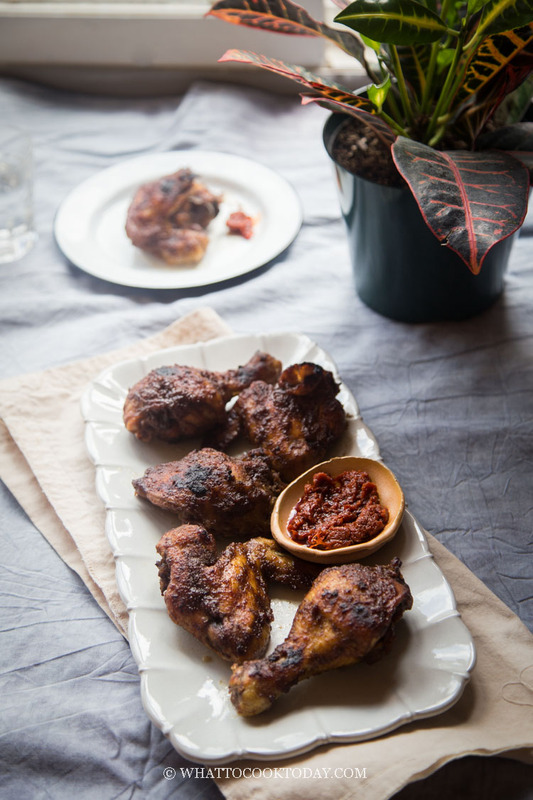 Ayam panggang bumbu kecap is traditionally made by boiling the chicken in spices, herbs, and kecap manis and then they are baked. 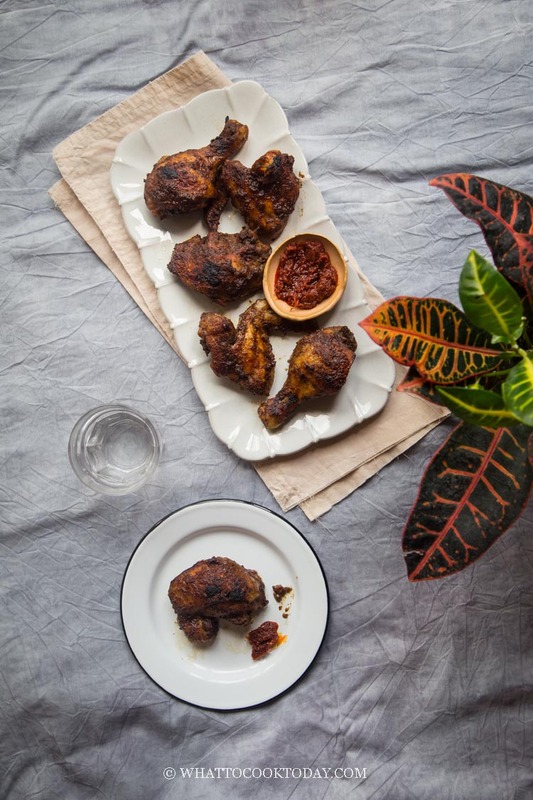 It’s not unusual to see many Indonesian recipes usually cook the meat twice, first to infuse the aroma from spices and herbs and then finished cooking by frying, grilling, or baking. I like to pressure cook the chicken first because the chicken is not overcooked. I’m not boiling the chicken to death so of speak. 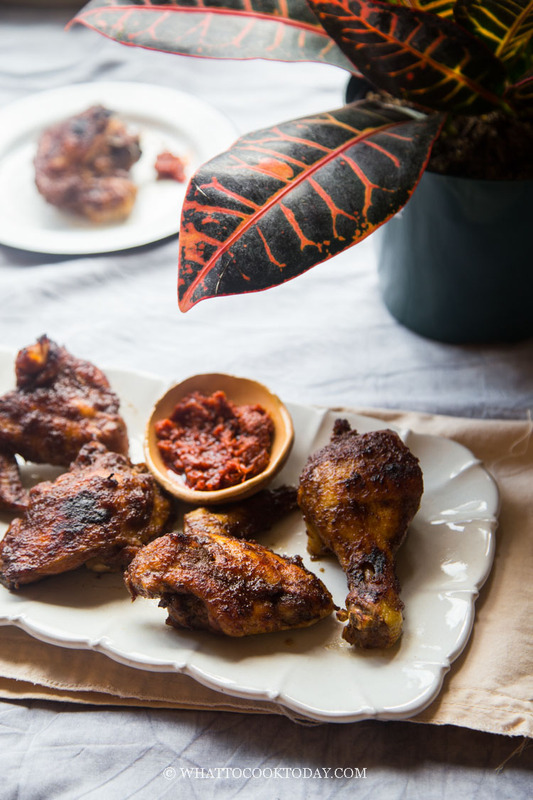 The chicken is still infused with great flavor and cooking time is short too. I use a mixture of thighs, wings, and drumsticks because I cut up the whole chicken. I don’t use breast because no one in the family likes chicken breast 🙂 Setting the pressure cooker time to 10 minutes is sufficient to cook the chicken without overcooking them. Broiling the chicken will add that nice char to the overall look. One of Indonesian staple ingredients is kecap manis if you ask me. Indonesian kecap manis is not only thick, and dark, but it is also sweet because of the palm sugar. 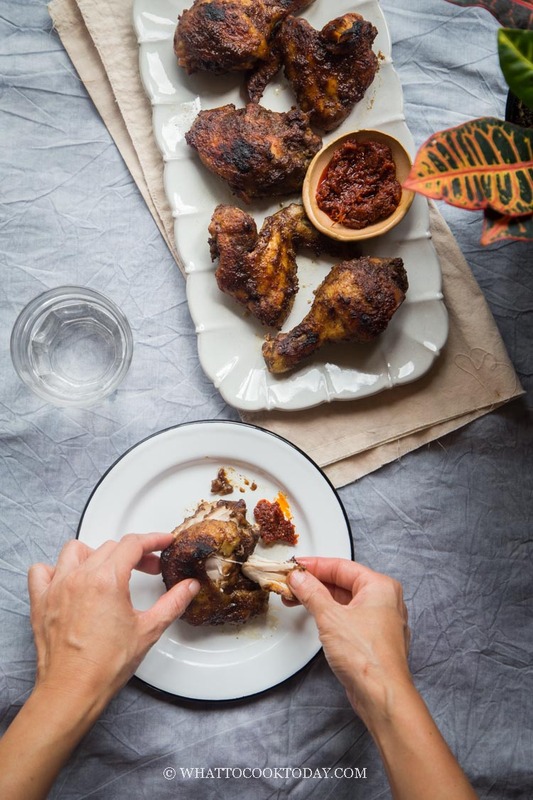 We don’t necessarily use it in every single recipe, not so much in Indonesian Chinese recipe, but traditional Indonesian recipes call for kecap manis more often than not. We use it in nasi goreng, ketoprak, sate ayam kecap, tahu goreng kecap, sambal kecap pedas, tahu dan tempe bacem. These are just to mention a few. 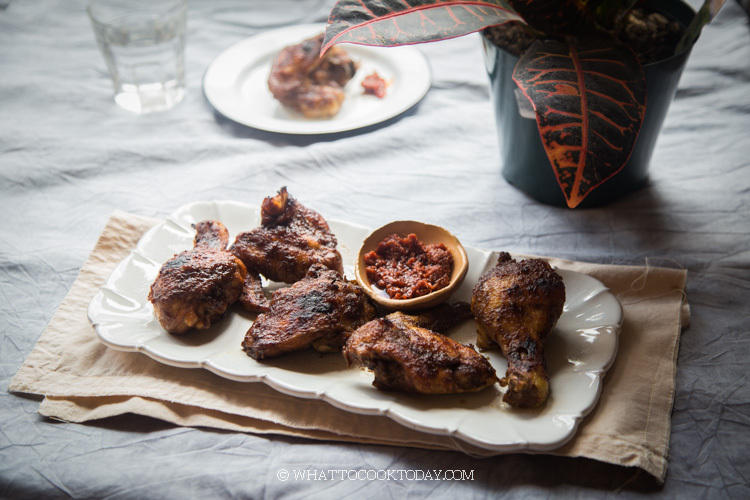 Kecap manis is also used to marinade meat, and also as dipping sauce. My favorite kecap manis is this kecap manis cap bango. Many Indonesians will tell you that too. But if you can find this brand, kecap manis ABC is a great substitute too. 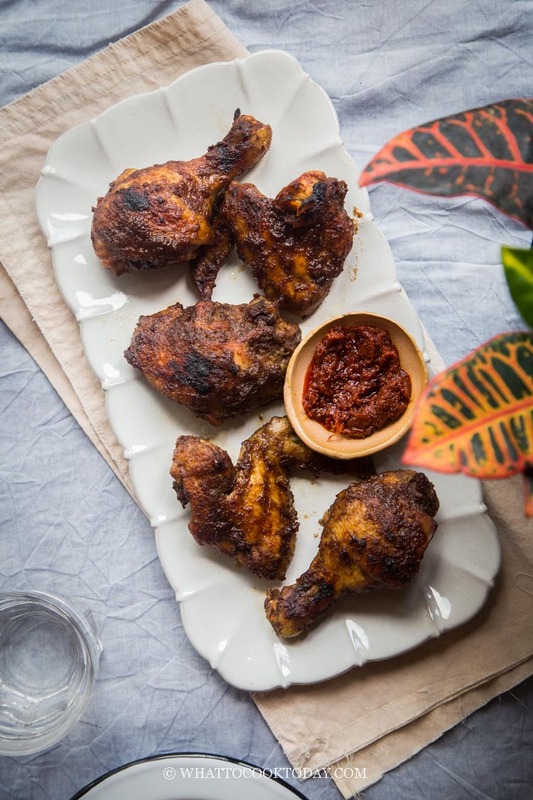 Pieces of chicken is pressure cooked with aromatic spices, herbs, and kecap manis and finished up cooking in the oven by broiling. Strain the cooking juice from the inner pot. You can either save the juice for other use as stock or discard. You will get some solid. Keep the solid! I am addicted to chicken that look just like yours. An interesting method, I would love to try it. I remember my grandmother often cooking the chicken legs before she put them in the oven, but I have never did myself more than a couple of times. Her chicken was always very tender. One of my fave Indo dishes (the other is ayam penyet)- i love the one at Plaza Sing in Singapore! Will have to try your recipe now that I live abroad! This looks yummy! What’s in the little dish in the first photo? What do you do with the strained cooking liquid ?